Issue 29 of Today Software Magazine carried an article by Bogdan Muresan, Director of Engineering at 3Pillar. 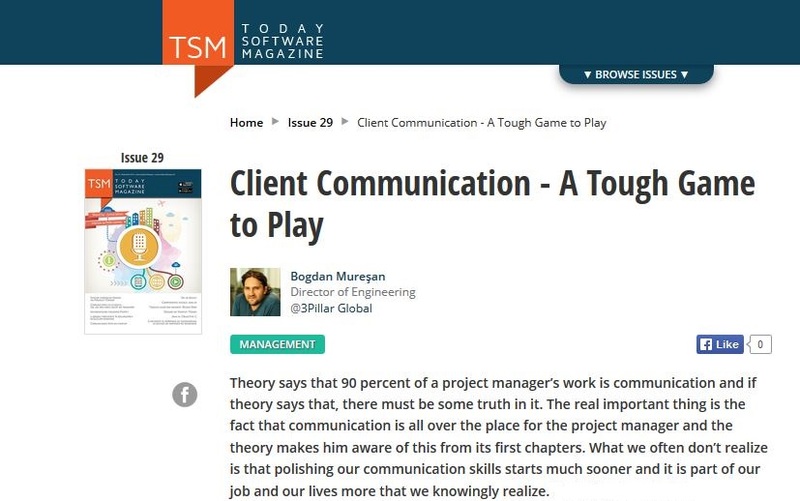 In this article, titled Client Communication – a Tough Game to Play, Bogdan emphasizes the critical role of communication skills for product managers during client interactions. He goes to on to highlight the fact that client communication today has assumed greater significance especially in an agile product development environment where teams have to frequently interact and report progress to their clients. Bogdan shares two important tips in this article to ensure communication with the client is seamless and helps convey the right message. He stresses the need to focus on “the content value” and “the content” itself. In framing the content for instance, Bogdan believes bringing the right arguments to the table will help explain any idea better. In the article Bogdan states that the language barrier is especially prominent during interactions between technical and non-technical people. He also illustrates real-world scenarios that he has encountered where a simple message was distorted and not effectively communicated because of not choosing the right words during a conversation.